There are dozens of breeding seabird sites in Northern Ireland. Seabirds present us with a number of problems and advantages. The main problem is that they often nest in inaccessible places including cliffs and islands. The survey period for some species is very short. Other species like shearwaters and petrels nest underground and only visit the colony at night, making it very difficult to monitor them. On the plus side seabird colonies are usually obvious, and even where the nests are cryptic (for example Black Guillemots) the adults are easily surveyed. 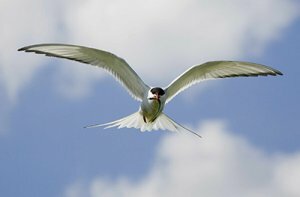 Seabirds tend to visit the same colony each year and spread to new sites slowly so the majority of colonies are well known. Once a site is accessed most cliff and ground nesting species are easy to count. The N.I. Seabird Co-ordinator is always looking for new volunteers to help out. There are many sites across Northern Ireland that could be counted annually and for which we need help. These sites have breeding guillemots, terns, gulls, cormorants and more. Most survey sites are quite small and should not take more than a couple of hours each year to count. So if you can spare that time please get in touch.